Today I’m writing from the train. I decided to take a short trip to Seattle. My actual reason for doing so is a wee bit complicated, so I’ll save it for a later post. But in the meantime I thought I’d pop on here and write a bit of a life update. I had a pretty fantastic response to my crazy idea. A nice healthy mix of strangers, family, and old friends welcomed me to their home areas. I came away from the experience with a new hypothesis: I think southerners tend to be more hospitable/chill with inviting strangers into their homes. Of course I had a small sample size. Do you think this is accurate, based on your own experiences? I had more offers than I needed, but some of the places offered were pretty close to each other, so I think I should be able to at least spend a little time in most of the places. A few days ago I sat down and made a pretty solid plan for where I’d like to go when. So yeah, if you invited me to your area, I’ll try to get back to you soon about what I’m thinking. Some of those interesting blog posts materialized. Some of them didn’t. I missed one of my trips due to illness, and the next one was fun but not that interesting for a blog post. I haven’t found the time to edit the video with Jenny. Here’s the problem with interesting blog posts: they take so much time. I used to be extremely careless with blogging. I’d just type up whatever I was thinking, “post!” and done. But ever since my year-long hiatus, I’ve been much more careful. Then, later that year, I went to Sharon Mennonite Bible Institute (SMBI). I’d gone to SMBI four years previously and loved it, which made me kind-of hype it up in my head. I thought that after all these years of college, I was finally going to a place where people understood me. And then I had a bit of a culture shock because I’d forgotten how Mennonite Mennonites can be, LOL. But roughly 10% of the students admitted that they knew who I was from my blog. And that made me panic a little. Here I was, missing all these random Mennonite nuances and doing the wrong thing, and people here know who I was. I wasn’t just getting things wrong, I was disappointing people by not being the kind of person they thought I was. After these two experiences, I wasn’t sure I’d ever blog again. I only did because I began to feel that God really wanted me to do it. But it just completely changed my attitude about blogging. I used to just really like the feeling of people reading my stuff and thinking I was interesting or whatever. After the hiatus it became much more about blessing people. So I put a lot more effort into my posts. Also, I was just way more aware of how I was coming across. I had this new fear of people misunderstanding me, of being too vulnerable, etc. I know that sounds bad. I know all the whoevers that know things about things say you need to be vulnerable. But for me, I had to learn the opposite lesson. I had to learn that I don’t owe the online crowd anything, and I don’t have to share more than I want to share. The consequence of this is that blog posts take a really long time. I write and re-write them because I want them to be the best they can be, so that they’ll be a blessing, but at the same time I only want to say the things I want to say. I thought that once I quit my job to become a “real writer,” I’d post more on my blog, because I’d have so much more time to write. And I do have much more time to write. But I’ve run into a new problem, which is that writing is my job, and blogging doesn’t earn any money. So it’s hard to allocate enough time for it. I’ve been far more disciplined with writing, and gotten far more writing done, than I thought possible for someone as naturally undisciplined as myself. Because this: If I don’t make it work, I will have no money. Right now, my biggest issue is precisely what I assumed it would be: Staying at home all day puts me in a weird head space. I mean I do my fair share of social activities, but I miss that feeling of getting up every morning and going to school or work. Any and all ideas to alleviate this problem are welcome. Summer is such a strange time in Oregon, and I wonder if it’s this way in other places too: Our boring little community suddenly gets this huge influx of new people to drive combine or work on the “hay crews” (actually straw crews) or sack seed or whatever. But you never meet these people because no one has a social life. Everyone is working 24/6. If you’re not traveling over the weekend you might see someone new in church on Sunday, and say “hi,” and play a bit of Mennonite game. And then never see them again because harvest is so short and intense. I am a huge fan of writing on trains. As I close out August, I thought I’d do a quick post with a few updates on my life. The internet on my little laptop is not working at all, EXCEPT Youtube works. And Google. But not Gmail. So, needless to say, being limited to the family computer and my little iPhoney does not inspire me to blog frequently. My eclipse story didn’t QUITE break my record for most hits ever in a day (that record is still held by my post on singleness) but it was my most-shared post ever. This got me thinking about how most of my really successful blog posts are opinion posts. But I would much rather be a storyteller than an opinion writer. I backed myself into a corner with this one. I’ll admit that when I posted about finishing classics I secretly hoped that my readers would give me the necessary encouragement to finish, and in the case of The Scarlet Pimpernel that was overwhelmingly true. So I thought I’d read it and report on what I thought, only to discover that I have no real way to talk about my experience of reading it without spoiling it for those who haven’t read it. Oops. Sorry about that. I’m starting my “real” job on Tuesday. Our little church school had a huge administration gap when my dad retired as principal last spring, so I was hired as secretary. (Not principal, because I didn’t want to discipline anybody, haha). Anyway, I wanted something part-time so I would also have time to write, and then this fell in my lap, so I took it. Hopefully this means that more Emily-authored writing will hit the world soon. My sister Amy came home from Thailand yesterday, so right now all three of us girls are living at home with no boys. I don’t know how long that will last, as I really would like to get my own place now that the thing-I-do-with-my-time will be earning money, not eating my money. But for now it’s fun. She is going back to college to get a teaching degree, to make it easier to get a work visa to teach overseas. Which means that every single one of my siblings will be in college this fall, except me. Matt’s getting his master’s degree, Ben’s getting his PHD, Jenny and Amy will be working toward their Bachelor’s, and Steven will be working toward his second Associate’s. We may not collect spouses or produce children, but we sure do collect degrees, haha. That’s all. I hope you feel sufficiently updated. Have you ever had a time in your life where everything was going reasonably well, except things having to do with blogging? You haven’t posted in a while and so you start to avoid your blog because it makes you feel guilty…. Yeah. In other exciting news, Friday night I slept for sixteen hours. It was an accident and I woke up feeling disoriented. And my new-for-me computer wouldn’t turn on. It wasn’t a very cheery morning. I would post pictures of some of the room projects I’m working on, except, oh wait…my room is a terrible wreck right now. It’s not my fault. I mean, if you live in a super-tiny room and want to paint two of the walls you sort of have to shove everything else into one corner. I could put up before and after pictures of my newly-spackled wall. In other news, this whole business with Japan has me feeling somewhat like I did when I was twelve and 9/11 happened. Yes, confused. Like, something so horrible has happened and I just can’t get my mind around it cause it’s so BIG, and there are so many factors to the problem. So I end up feeling more bewildered than sad. Pictures, I think, are best. Not big before and after shots of the landscape, or pictures of indistinguishable rubble, but one of people in the grocery store, looking for food, while the shelves stand empty. I think pictures like this touch me most. Ones that shows what life is like in these terrible frantic days where everything is in disarray. Can you imagine going into Safeway and seeing all those empty shelves? You might get a basket full of stuff…and then have to haul it over wrecked cars. If I was a journalist covering the disaster in Japan, I would explore what the typical day is like for those who’s lives were effected by the tsunami. Like, work for instance. 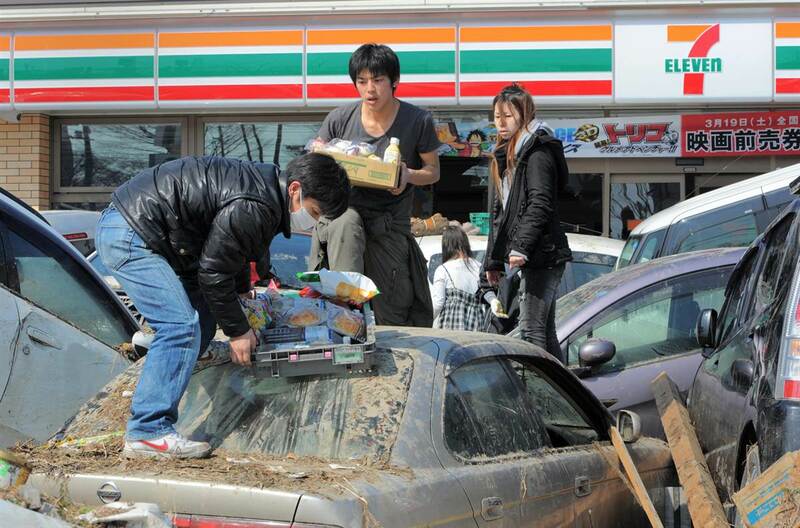 Would you go to work the day after a tsunami hit? My first thought is, “of course not,” but what if you worked in a grocery store? You know? Maybe they’d want you to come in even if it was your day off, because they knew everyone was going to be rushing in and buying food, and they needed every employee they could get their hands on. Would your boss be able to contact you? Would your cell phone work? So your job is ten miles away and your car is destroyed. What do you do all day? Look for missing family members? Move cars off the road? Salvage as much as you can from your house? Try to keep your things from being stolen? 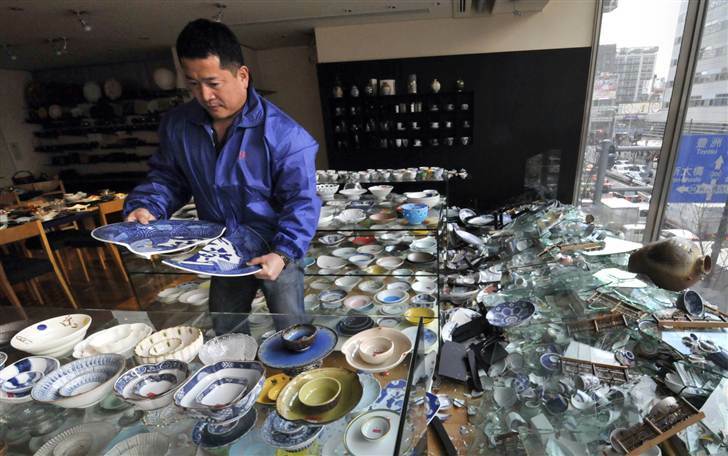 I wonder about this guy, salvaging his beautiful pottery. Will anyone buy pottery at a time like this? And also, if someone did want pottery, what would keep them from just walking in and taking it? These pictures, somehow, make me sadder than a headline stating that tens of thousands are dead. 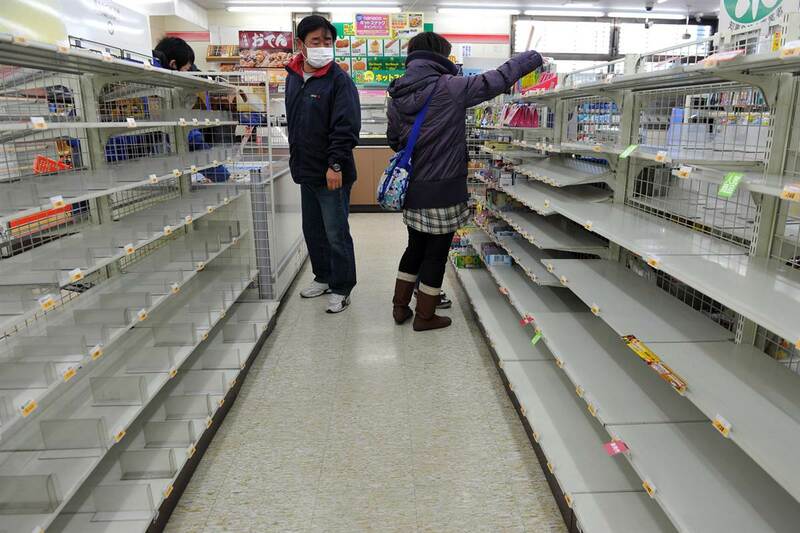 It’s not really the dead ones I’m sad for, but the people who are trying to deal with dead family and friends, while going to the grocery store and finding no food on the shelves.